Wheels are an important part of any vehicle, so you need to make sure that you keep them shiny and sharp at all times. This can be quite a challenging task since they are the part that gets dirtier than any part of your vehicle. Well, any part that can be seen at least. The two main culprits are: road grime and brake dust. 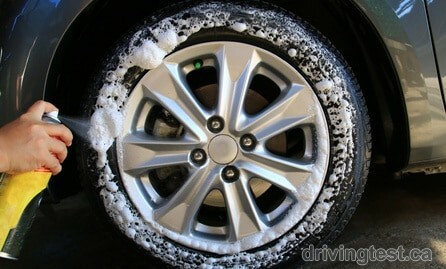 Brake dust can do a lot of damage such as etch the finish of your wheel if you leave it unchecked. When it comes to road grime, it is more of an aesthetic issue, but it can be very annoying nonetheless. Thankfully, there are simple ways to keep your wheels looking clean and shiny. Needless to say, choosing the right cleaner is critical. There are many high-quality all-purpose cleaning solutions made from the best, biodegradable, eco-friendly ingredients that can be used on all types of vehicles. There are also heavy-duty cleaners for stubborn dirt and grime on wheels. You can choose one based on how dirty your wheels are. You must remember never to spray water or cleaner on wheels while they are still hot. This may damage your brake rotors and compromise your wheel’s finish. Always allow your brakes and wheels to cool after driving. Also, if possible, avoid washing your wheels in direct sunlight. You should always remember to clean your wheels one at a time, so that the product does not dry on the surface. If you are using a heavy-duty wheel cleaner, be patient and keep a look out for the color-changing effect that comes with this type of cleaner. If the product does dry, all you have to do is spray it again so that the cleaning action gets reinvigorated. Before you spray your wheel cleaning product, always make sure that you rinse the wheel thoroughly with water. This will allow the product to be carried to the wheel’s tight spots and remote areas. Also, the pressure from the hose blasts out some of the sediment and dirt right away, meaning that the wheel cleaning solution can work on even the toughest grime, blemishes, and gunk. Brake dust can be tough to clean, especially in the deep corners of wheels. There are a wide range of all-purpose tools that can help make cleaning these areas easy. These purpose-built tools will allow you to thoroughly clean even the most challenging wheels, whether intricate, multi-spoke, or super-fine mesh designs. If your car cleaning regimen involves using a bucket and wash mitts, it is a sagacious idea to keep a separate bucket and mitt for the wheels. If you do not do this, you could end up picking up and transferring dirt or metallic brake dust, which is even worse as it can do a lot of damage to your paint. You should wash your rims last anyway for this reason and others. You should wash from top to bottom right? But you certainly do not want to be the one who damages your paint finish by scratching it up since you have tiny sharp objects caught in your wash mitt. With the force of your “elbow grease” you could end up scraping your car’s paint and then you will probably invent some new terrible words in the English language. Every time you clean your wheels, you should make sure to give them one good final rinse. Follow this with a complete wipe-down with a clean drying towel. This will help ensure that water spots do not form. There are several brands that sell quality drying towels that are perfect for this job. Does cleaning your lug nuts leave you totally frustrated? You are not alone. As you know, water often pools in lug nut holes and as soon as you move your vehicle, your pristine wheels have water dribbling all over. You can keep this from happening by making sure that you dry the lug nut holes as thoroughly as you can. Always make this a part of your car or wheel cleaning regimen. As with any part of car maintenance, it is the details that make a world of difference with your wheels. When you work hard and do things the right way, it is certain that you will be rewarded. There are products that you can use for removing embedded contaminants that cannot be tackled by washing alone. And you should also think about removing your wheels every once in a while to clean the back sides. People who see you might think you have gone crazy, but this can help your wheels last longer, could help out with the fuel economy, and could end up making your car look better since some of the grime on the back side is sometimes visible when looking at your car. Maintaining your car is integral to make sure that it looks good and runs well for many years. Some car owners do not focus on the wheels like they should. However, there are ways to do the job yourself – and do it well. All you need to employ is the commitment and the right supplies and products. With the tips mentioned above, you can make sure that your wheels look as immaculate as the rest of your vehicle. And there is nothing wrong with that!